Escape Into The Wild is blog of Viral Patel and Pankaj Maheria's wildlife photography include animal, bird, marine life, insect and other. We click with Nikon D500, Nikon D7100 and Nikon B700 in sanctuaries of Gujarat and India.! Campus of GMERS Medical College situated at Patan spreads over 66 acres of land. It is the place where I am working. Me and my small family is staying here in staff quarters. We saw many birds in our campus. Our count of campus birds over two years is seventy+. 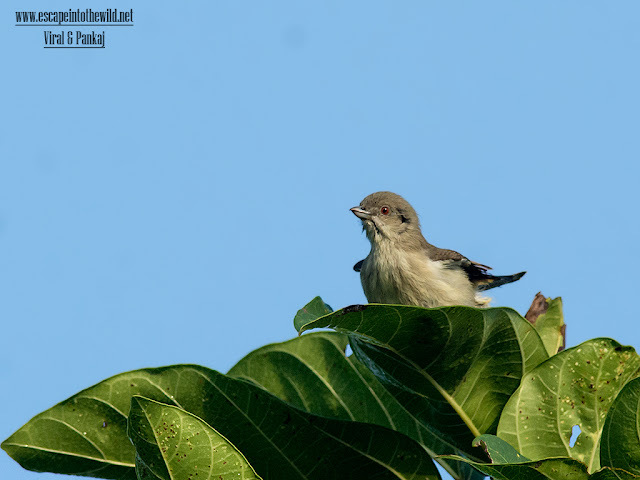 Thick-billed Flowerpecker is one of them. During our morning walk we saw this beauty. It came to eat Indian fig tree fruit in our campus. When we first saw this small bird immediately get to know it is Thick-billed Flowerpecker by it characteristic red eyes and shape of bill from which it gets own name. We can register its presence almost daily at morning walk during fig season. 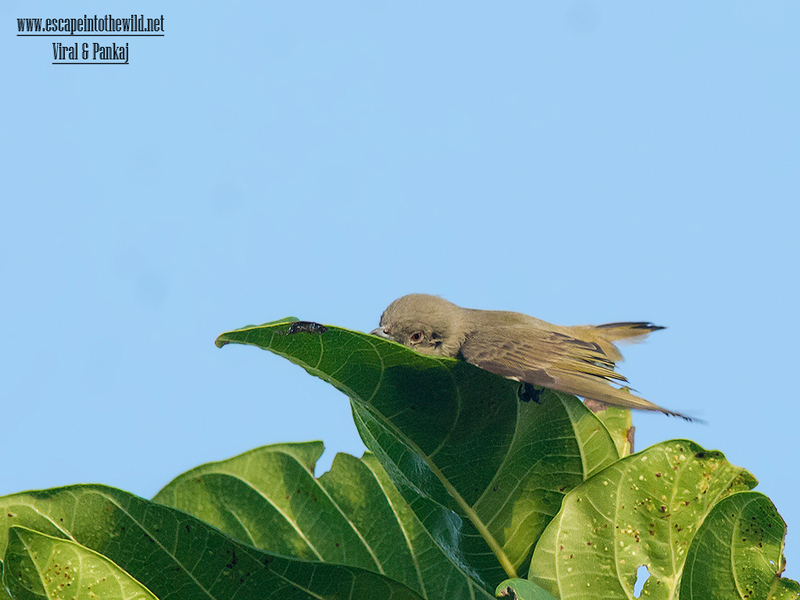 Most of time its routine schedule is first to do preening by rubbing itself with leafs probably applied some kind of secretion from leaf of the Indian fig tree specifically on top branches warmed with soft morning sunlight. It was kept moving hurriedly from one leaf to other. Once its finished preening than it was came to lower branches. Usually it was started foraging for small ripe fruit. 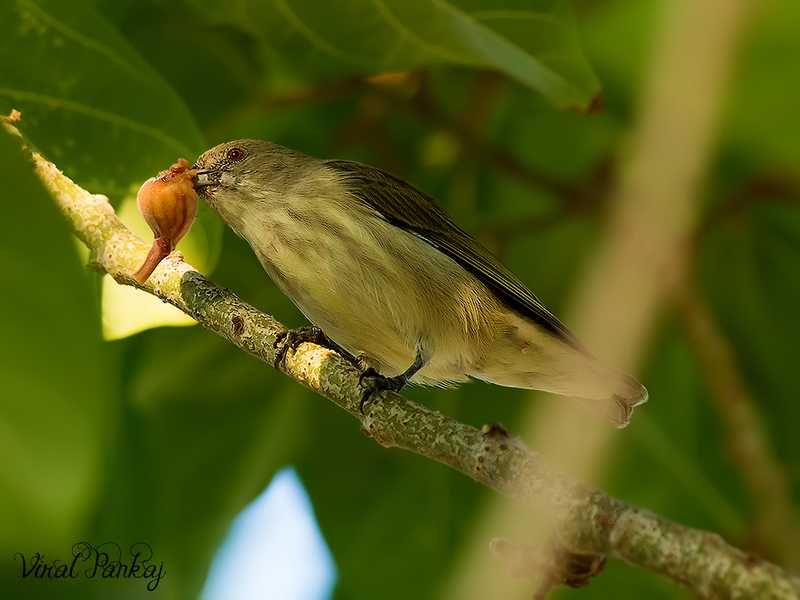 When it finds the perfect fruit Thick-billed Flowerpecker eat the fruit hastily using its beak. Unlike the pale-billed flowerpecker, it does not swallow the fruits and instead wipes the seeds on a branch frequently and feeds mainly on the epicarp. Foraging birds produce a spick call frequently and the tail is jerked from side to side when perched. 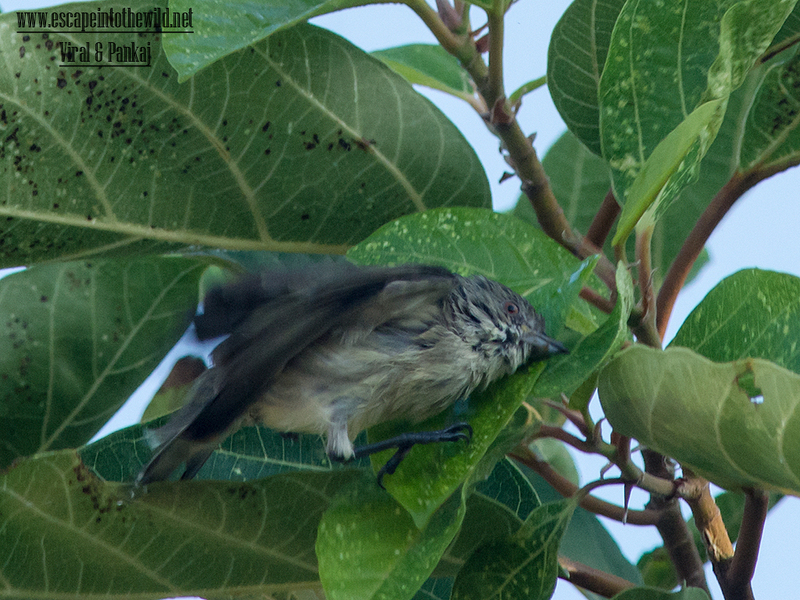 The thick-billed flowerpecker (Dicaeum agile) is a tiny bird in the flowerpecker group. They feed predominantly on fruits and are active birds that are mainly seen in the tops of trees in forests. Like other flowerpeckers they feed mainly on berries, nectar but sometimes take insects. Many of the subspecies are found in dense lowland forests with the exception of the nominate race which is found mainly in cultivated areas or open forest. This blog is of our photography of mother nature. Like it, Share it with friend..